(p. 4) For Mr. Davidson, Dubai’s greatest weakness lies in its autocratic governing system. Politics in the emirate, as in most of the Middle East, pivots not on institutions but on clans — a ruling dynasty and its favorites who own and run Dubai in opaque fashion. True enough, but most of the Middle East is authoritarian, yet Dubai’s enlightened despotism and welcoming social environment have stood out for fostering economic advance. Like China, albeit on a tiny scale, Dubai is engaged in an experiment of economic liberalization without political democracy. Mr. Davidson further contends that unstable neighbors threaten Dubai’s success, but here he may have matters reversed. When Egypt and Iran stifle their entrepreneurs, many of them find a wide berth in Dubai. When Saudi Arabia imposes cultural restrictions on its population, Dubai offers a place to drink and let loose. When India and Pakistan have trouble creating jobs for their large populations, Dubai absorbs labor migrants. When Iraq or Lebanon descends into war, Dubai profits from rebuilding them. In short, until a vast arc of countries from East Africa to Southeast Asia changes substantially, Dubai will remain poised to benefit by providing a relatively open, secure, low-tax, business-friendly alternative. STEPHEN KOTKIN. “OFF THE SHELF; The Glittering Emirate, Revisited.” The New York Times, SundayBusiness Section (Sun., December 7, 2008): 4. 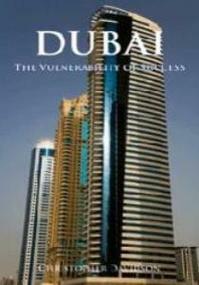 Davidson, Christopher M. Dubai: The Vulnerability of Success. New York: Columbia University Press, 2008.